My personal brush library, of which I really only use 3. If you ask any digital artist, what is the single most annoying question they hear all the time? Most of them will probably tell you the same... "What brushes do you use?" It's inevitable. Students are always looking for that 'secret ingredient' that is going to suddenly make their art great. And although the right tools DO make a massive difference, the truth is, the real secret ingredient is simply hard work. Still, no matter your medium, the same old questions always come up... What brushes do you use? What surface do you paint on? What kind of pencil do you use? Now, this is not to say that a student shouldn't ask these questions. They should! You should always be inquisitive! But that inquisitiveness should encompass an interest in ALL your potential mediums. Rather than ask an artist what type of paint they use, and then simply use that paint for no good reason other than imitation, why not try every brand of paint you can get your hands on and then decide for yourself which one YOU like best? These issues seems to be particularly prevalent amongst digital artists. Perhaps it has to do with the fact that everyone is working with the same tools, so finding a brush that makes your work look unique is all the more important. Whatever it is, the question (no matter how annoying) is an incredibly valid one. Fortunately, there is a website that answers that question for you! 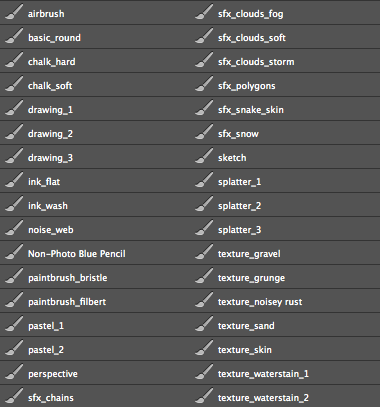 Digital Brushes is a Tumblr that has collected all the digital brush packs they can find in one place. It's a incredibly wonderful resource for digital artists, and I've downloaded a LOT of them myself. For those of you that work digitally, I encourage you to really scour these brush packs. Try them all out, find which ones work best for you, and then modify them to suit your own personal needs. Or better yet, figure out how they work, and then make your own! Perhaps the next time you hear the question 'What brushes do you use? ', it will be some student asking YOU.